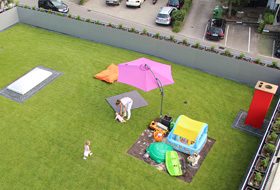 A beautiful lawn for relaxing, playing and having fun was created on the roof of this ware house adjacent to the new residential building. The living accommodation of Simon Böhringer and his family is on the first floor and has direct access down a few steps to the green area. The surrounding rail and the skylights with their fall-through protection are the only reminder that this garden is actually on top of a roof. "We now have lots of space for running around, but we need a little rest!" The parasol has a water-filled base and can be moved around the entire roof area. Dozens of box trees and blossoming plants provide decoration along the railing around the roof edge. The irrigation system for the plants was directly attached to the dripperline system. The Aquatec® elements and the irrigation system contained in them are installed according to schedule. 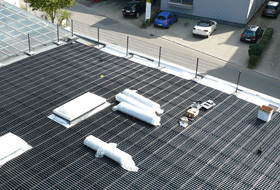 The dripperlines in this roof area are 50 cm apart and will now be connected to supply and flush lines and to the irrigation manager. The basic principle: the dripperlines clipped into the division bars feed water to the Aquatec® elements. Transported upwards through the wicking mat, the water is made available directly in the root area. 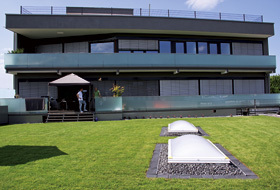 In the town of Weinstadt in Baden-Württemberg (Germany), two roof terraces intended for private use were created by the company Böhringer as part of a new multi-storey residential building adjacent to an existing warehouse. Due to restrictions in the structural load capacity of the warehouse, a low-weight green roof solution with a low build-up height was required, but one that could nonetheless accommodate an intensive green roof with a lawn. A case for ZinCo! The system build-up “Summer Plains“ with its totally innovative and highly-efficient plant irrigation system enabled us to meet the client requirements. The approx. 350 m² large roof terrace on top of the warehouse has a number of special features that were fundamental to the planning process. As already mentioned, the warehouse roof is restricted in terms of structural load as it is a trapezoidal structure. Another fact that had to be considered: for drainage reasons, the warehouse roof has differing pitches of between +2 % and -2 %. This doesn’t sound like much, but it does however eliminate the use of an efficient dam irrigation system, which requires a 0°-roof, for the planned lawn size. As the client requested an intensive green roof with lawn and given the specific building conditions, the key to success was: the ZinCo system build-up “Summer Plains”, which requires load reserves of only 165 kg/m². We also had to take into consideration loads that would be created by people using the roof and by snow during the winter. 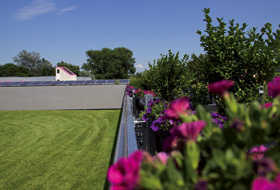 “We are delighted to have found this green roof solution“, said the client, Simon Böhringer. The crucial part of the system build-up “Summer Plains“ is the water distribution, storage and drainage element Aquatec® AT 45 in combination with Wicking Mat DV 40. The basic principle involves the distribution and storage of water in the cells of the Aquatec® elements. When there is a lack of natural precipitation, water is is fed through the driplines installed in the elements, as required. The water is drawn upwards by capillarity through the wicks in the wicking mat to the substrate layer, where it is available directly in the root area of the plants. With this method, no water is lost through evaporation, as would be the case with auxiliary irrigation using a lawn sprinkler. Finally, this very efficient irrigation concept allows for a shallow substrate depth of only 10 cm and consequently low weight. 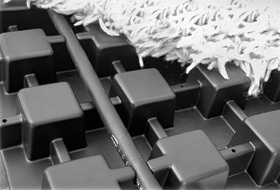 Thanks to the wicking mat, there is no need to fill the drainage elements with substrate as is required with other systems. This also saves on weight. 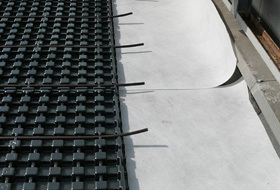 First of all, the root-resistant sheet WSB 100-PO was installed onto the roof waterproof membrane of the warehouse and professionally welded. Then the filter sheet PV was installed as a protective layer. 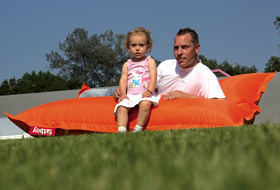 This was followed by the 1 x 2 m large Aquatec® ABS elements as part of the system build-up “Summer Plains”. These are easy to install as the elements cannot slip thanks to the studs and overlapping edges along two sides. When planning the actual irrigation system it was important to take the existing roof pitch and other uneven zones into consideration in order to ensure an even distribution of water in the Aquatec® elements. As part of the service, the system is fine-tuned by the engineers in the ZinCo Application Engineering department and the technical experts on site. Four dripperlines per Aquatec® element were sufficient for the existing pitch of about 2%, resulting in a clearance in each case of 50 cm. The dripperlines were simply clipped into the division bars of the Aquatec® elements. The water circuit, already connected to the supply and flush lines, was then connected to the BM 4 irrigation manager, the central electronic control unit. In order to fully test the system, an irrigation trial run was carried out. The idea was to identify any areas that were not supplied with sufficient water and above all to determine the amount of time required until such time as the drainage area was filled with water. In addition to switch-on time and seasonal frequency, the duty cycle is an important factor to be considered when programming the irrigation manager to meet specific requirements. An integrated switch with external rain sensors ensures that the programmed irrigation cycle only kicks in if there is insufficient natural precipitation. After the successful irrigation test run, the wicking mat and 8 cm of ZinCo system substrate “Lawn“ were installed. This substrate has particularly good capillary properties and has the advantage that it is delivered in a silo tanker and can be easily piped up to the roof. As regards distributing the substrate, it was tempting to simply level out the various uneven spots on the roof. However, the argument against this was once again the limited load reserves. For this reason, we followed the existing roof pitch and spread only 8 cm of system substrate across the entire area. A further 2 cm were added with the pre-cultivated turf rolls. 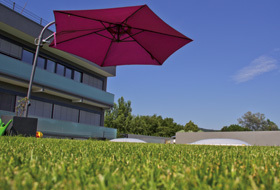 The resulting lawn is characterised by a light dynamic, which is proving to be very appealing. While the green roof on the warehouse is already being used for play, fun and relaxation, the roughly 170 m² large roof area on top of the new residential building house is in its final stages of installation. With the 20m² large terrace area, you can see that combinations of different surfaces are possible. The Aquatec® elements provide for continuous drainage throughout, i.e. drainage beneath the surface coverings. However, the elements here contain no dripperlines as irrigation is unnecessary. From a vegetation point of view, anything that is suitable for a simple intensive green roof can be planted with the system build-up “Summer Plains“: blossoming perennials, fragrant herbs or semi shrubs. As the roof of this residential building has a greater load-bearing capacity, very creative planting is possible.